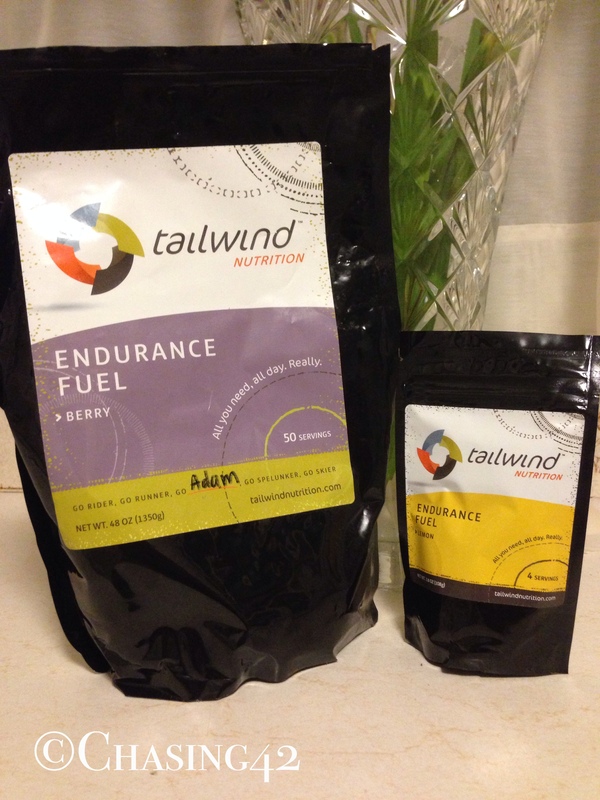 For most of the summer, I’ve been using Tailwind nutrition as my go-to nutrition source during most runs over 10 miles, and I thought I’d share some thoughts. 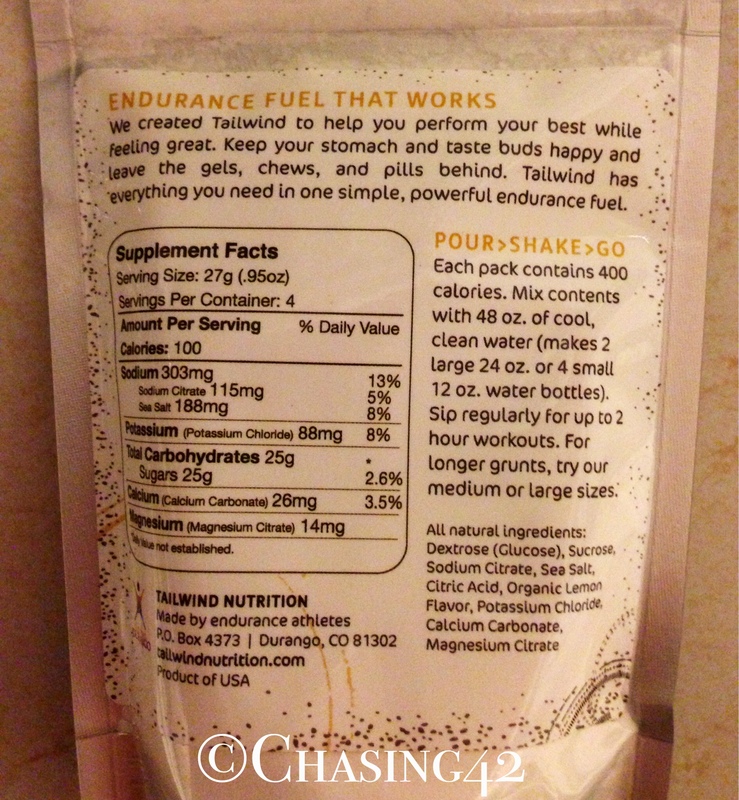 Tailwind kept popping up on various ultrarunning blogs and websites that I follow, and I’m always on the lookout for the most efficient nutrition solution for what I can only describe as a finicky stomach. I’ve mentioned before that I have given up on all sports drinks, and most GUs and Gels don’t sit well in my stomach either. The sugar just seems to be too much for me, and I always end up with a few unplanned pit stops. So, I was excited by the idea of an all-in-one nutrition product that I could dissolve in water and drink throughout my entire run. I typically carry some sort of portable hydration solution, whether it be the incredibly comfortable and economical Simple Hydration Bottle (love this bottle!) that frees up my hands during shorter, faster runs, or my Salomon pack, which sustains me for most of my long-distance training. Tailwind offers a pretty exciting product that has the potential to eliminate the need to carry around additional GUs, chomps, bars, and electrolyte pills or tabs. Since I’m already carrying water, this seems like a no brainer…on paper. However, did Tailwind come through and lighten my load without lightening my stomach? It has absolutely come through! I’ve been nothing but impressed with this product. It truly does offer the complete calorie + electrolyte + hydration solution. The taste, portability, ease of mixing, and easily digestible nature make this product my new go-to nutrition solution for training runs and races. My order even came personalized with a hand-written thank you note! Taste: I ordered the berry flavor, as this is usually my first choice with any new product. I was initially skeptical after tasting so many different artificial berry-flavored sports drinks and flavored waters. However, the berry flavor was light, smooth, and refreshing. It was not overpowering, and it mixed with the water so completely that I would have never guessed it had been a powder. They recommend approximately 1 scoop per 12 oz. of water, but I’ve added even more for some added calories and it still mixed cleanly like a champ! They sent me a small package of the lemon flavor as a thank you for my first order, and I had the exact same reaction. I usually hate lemon and lemon-lime flavored drinks (why is it ALWAYS lemon lime at aid stations?! ), but the Tailwind lemon was just as smooth, light, and refreshing. I’m looking forward to tasting the mandarin orange as well. Portability: I’ve been able to carry it around with me in several different formats. When I want to pack extra on self-supported runs, I simply portion it out into ziplock bags and carry them in my Ultraspire Quantum waist belt. It’s really easy to empty the powder into my empty water bottle and fill it up at a water fountain around town. I’ve also simply brought along the entire bag and left it in my car so I can circle back at various points, very much like you would do with a drop bag during a race. I plan to drop empty water bottles with the Tailwind already in them as well, which should make for a quick transition. Tailwind even sells individual pouches for ultimate portability! Ease of Mixing: What can I say? It takes minimal effort and dissolves quickly and completely. You’ll never have a gritty aftertaste or see it settle at the bottom of your bottle. Cleaning your bottle out is as simple as if you were only using water. Digestion: This was the biggest test for me. How would it sit in my stomach? My sugar intake overall is now so low that I can barely stomach the taste of sports drinks because they are so sweet. Tailwind has such a light taste that it’s more like drinking water with a hint of berry to make things interesting in your mouth. I’ve used it exclusively for up to 6 hours thus far, and am happy to report that I have not once had any GI issues! I feel full, hydrated, and energized, and my calorie consumption seems to be more consistent as well. It’s easy to forget to eat at times, but you are always drinking. On average, you can estimate 1 scoop (100 calories) per 10-12 oz. of water, and I’ll consume around 20 oz. of water per hour. I’ve found that it works well to put the extra Tailwind into tiny ziplock bags that you can easily dump into your bottle/pack when you are ready to mix up a new dose on the run. I’d definitely consider it, especially with all of the consecutive racing! I have been able to consume nothing but Tailwind for hours on end with no GI issues whatsoever. Best of luck with your 4 consecutive races (Dopey Challenge?)! Thank! 20oz of water in a hour! wow I don’t know if I could put that much down LOL. You could probably dial it back a bit, and add in some solid food (trail mix of some sort, perhaps?) 🙂 Best of luck!